In this document, you will find a picture of a couple (copied below) on their marriage day. She, Monica Green, is a parishioner from our parish in Welwyn. 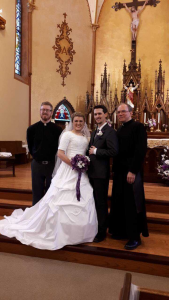 In the old SSPX, we would have married her at our chapel over there, like we did with many others before. Moreover, while Fr. Vachon, Assistant priest of Winnipeg Prior Fr. Loren Gerspacher, celebrated the traditional Mass, it was a Novus Ordo priest, delegated by the Novus Ordo bishop, who was the official Church witness receiving the vows! On the picture you can see Fr. Vachon on the right, and the Novus Ordo priest on the left. Everybody is smiling, of course! On the same bulletin, you also have a letter from Fr. Daniel Couture (Canadian District Superior) praising Archbishop Lefebvre’s fight against the inversion of the ends of marriage at Vatican II. It is actually a good letter! Well, we have here a typical example of the Neo-SSPX tactic: Talk big, and strong, and traditional, but in your actions, walk liberal! Your talk is there to make people accept your walk! It also helps make you feel that you are not as liberal as you seem, so you can stiffle your guilty feelings (if you have any) and sleep better at night! 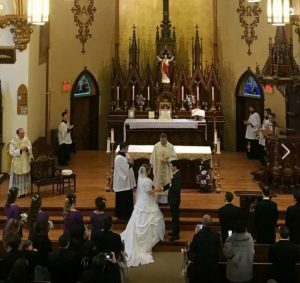 The Neo-SSPX is now consistently mixing up together the liberal and the traditional, the bitter and the sweet! There is nothing else to say but: The Neo-SSPX is turning Chinese!